An ISO Image is usually used to manually install an operating system and application onto a new virtual server. It is often used to create new disk images. In the upper right corner is a button labeled Show All, which can be used to display all ISO images, including ISO images that are not associated with the current working virtual data center. Name - Unique ISO image identifier (usually used in the API). Alias - User-defined name of an ISO image (usually displayed in the GUI). Public - ISO image is usable by all users in this virtual data center. Private - ISO image is usable by SuperAdmins and owners of this image. Owner - ISO image owner. DC-bound? - Whether an ISO image is bound to a specific virtual data center. (none) - ISO image can be used by any KVM virtual server. An ISO image can be created, updated or deleted by a SuperAdmin or by an IsoAdmin (DC-bound ISO image only). All ISO image operations are currently performed only at the database level. 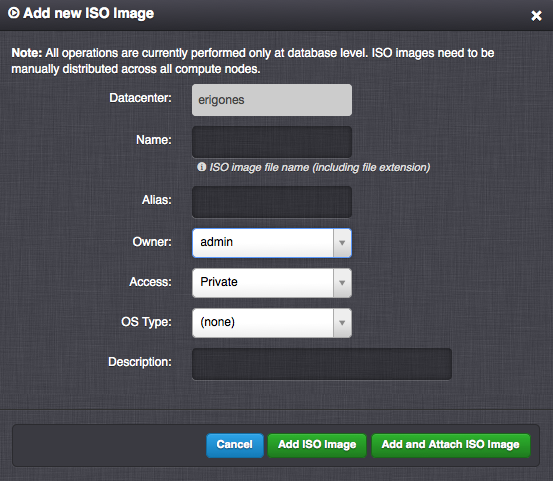 ISO images need to be manually distributed across all compute nodes. The default Rescue ISO image cannot be deleted. Installation of some operating systems (Windows) may require the use of two virtual CD-ROM drivers. Used for associating an existing ISO image with a virtual data center. This operation can be performed only by a SuperAdmin. An ISO image can be only used when attached to a virtual data center. In order to remove an association of an ISO image with a virtual data center, the ISO image should not be used by any virtual machine within the virtual data center. This can be performed only by a SuperAdmin.